It is comparatively easy - given a bit of luck concerning those who actually had their births and marriages registered in the Old Parish Records - to trace one’s direct ancestors on the World Wide Web in the Scottish context, back to the generation [and further back in time] of one’s 16 Great-Grandparents, as shown in this example based on my father, James Nicoll Kerr Henderson (1908-1989). However, it can also be very rewarding to discover the descendants of the siblings of all parents, Grandparents, and Great-Grandparents, as, all such persons, - siblings and their descendants – down to the present day, are various levels of nth cousins to the root person – in the above example he being James Nicoll Kerr Henderson (1908-1989). If you share at least one set of grandparents with a person, that person is your 1st Cousin. Thus, if you share at least one set of great-grandparents with a person, that person is your 2nd Cousin. … and so on! We all tend to know who our 1st cousins are/were. But, a few years ago, after completing my father’s male line ahnentafel back for fully 6 generations into the 1600s, I was intrigued, when I realised that I did not know any persons whom I could call 2nd Cousin, 3rd Cousin etc! 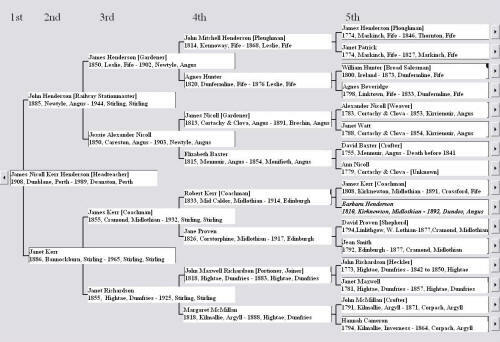 Thus, I re-directed my computer on-line investigating firstly to the possible descendancy lines to the present day of siblings of John Henderson (1885-1944), James Henderson (1850-1902), John Mitchell Henderson (1814-1868) and James Henderson (1774-1846). I soon realised that each of these in itself was a huge task, as any sibling’s marriage could produce a ‘spreading’ increase in each subsequent descendant family line, including multiple surname appearances due to female siblings’ marriages. However, undaunted, I simultaneously, when temporarily frustrated by any Henderson tracing, also delved into the Kerr ancestors’ sibling descendancies. 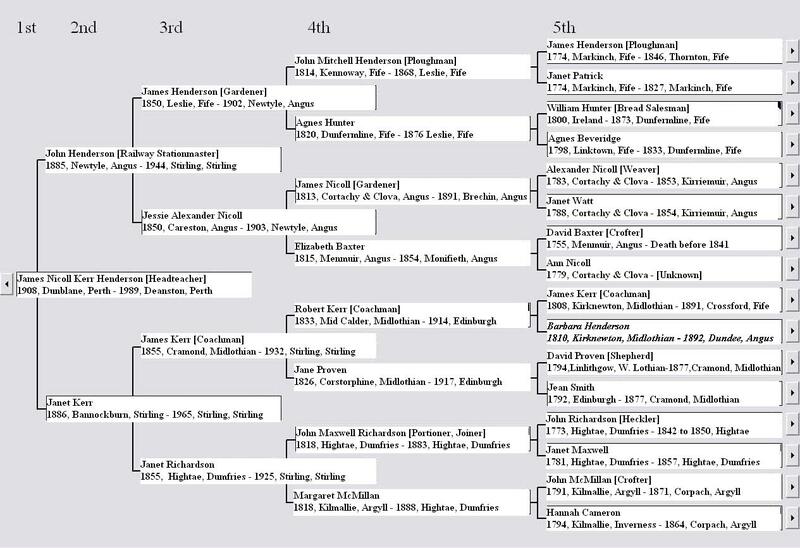 As of today, in 2009, I have been very successful in tracing many hundreds of living cousins worldwide of up to the 6th Cousin level, ... and it gives me great comfort to know of the existence of so many blood-kin who share our historic Scottish ancestry back into the 17th Century. In all such investigations, costly as these can become, a number of agencies, like the General Registry Office, Edinburgh, (GRO) and the Mormons, increasingly provide longer and longer indexed lists of Births/Marriages/Deaths and Censuses. But to complement discoveries from such B/M/D/Cs, other agencies have emerged to offer computer services which ‘Smartmatch’ the family tree data that you lodge with them [on the basis of limited variables !] against data similarly lodged by others around the world. Before furnishing you with a number of other significant sources for data and assistance, I will illustrate, via my Great Grandfather’s Kerr line sibling descendancy, the type of rewards that successful ‘Cousin Seeking’ brings. e.g. I have met many of my formerly unknown Canadian 2nd and 3rd Cousins recently in Toronto and Winnipeg, and I am in e-mail touch with others I have yet to meet.